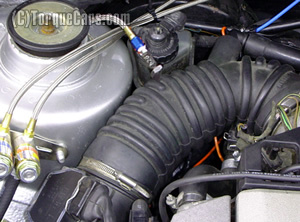 compression figures or due to forced induction. pistons, reduce the airflow into the engine or use water injection. engine and head but this is not a primary consideration. allowing the manifold flow to direct the water charge. to tune for the weakest common denominator. (compressing air increases its temperature). acceptable with the droplets reducing in size as atomisation occurs. compression heat) will finish off the atomisation process. rpm. As an example lets look at manifold pressures. could take this into account. and replace these with corrosion resistant ones. The next worst thing to happen is a sudden loss of water injection. adjust the fuelling and it would be similar to using a low octane fuel. will provide a 50% injection if one fails. spare water with you, check all delivery lines for chaffing or rubbing. make the difference between a drivable fun car and a lumpy dog of a car.